Computer Simulation suggest 68 percent of the universe does not exist! We're talking about the space in between space. Our observable universe has holes in it, but what is in those holes is the question. Dark energy has never been directly observed, and can only be studied through its effects on other objects. Its properties and existence are still purely theoretical, making it a placeholder plug for holes in current models. The mysterious force was first put forward as a driver of the universe's accelerated expansion in the 1990s, based on the observation of Type Ia supernovae. Sometimes called "standard candles," these bright spots are known to shine at a consistent peak brightness, and by measuring the brightness of that light by the time it reaches Earth, astronomers are able to figure out just how far away the object is. 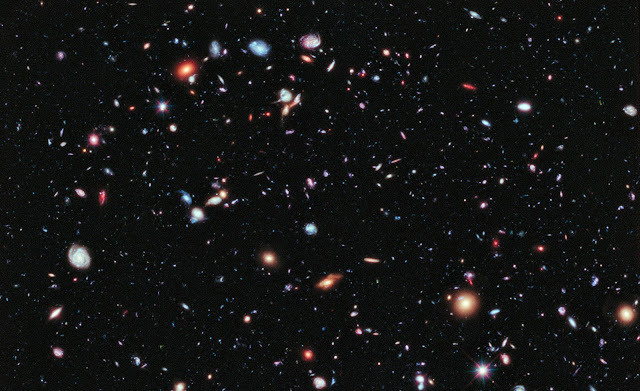 This research was instrumental in spreading acceptance of the idea that dark energy is accelerating the expansion of the universe, and it earned the scientists involved the Nobel Prize in Physics in 2011. But other studies have questioned the validity of that conclusion, and some researchers are trying to develop a more accurate picture of the cosmos with software that can better handle all the wrinkles of the general theory of relativity. According to the new study from Eötvös Loránd University in Hungary and the University of Hawaii, the discrepancy that dark energy was "invented" to fill might have arisen from the parts of the theory that were glossed over for the sake of simplicity. The researchers set up a computer simulation of how the universe formed, based on its large-scale structure. That structure apparently takes the form of "foam," where galaxies are found on the thin walls of each bubble, but large pockets in the middle are mostly devoid of both normal and dark matter. The team simulated how gravity would affect matter in this structure and found that, rather than the universe expanding in a smooth, uniform manner, different parts of it would expand at different rates. Importantly, though, the overall average rate of expansion is still consistent with observations, and points to accelerated expansion. The end result is what the team calls the Avera model. The Predator Teaser is here! Vintage Control Rooms and Stations, why not?